What position do you hold, besides being a HousingWorks Austin board member? I’m the executive director of GNDC. 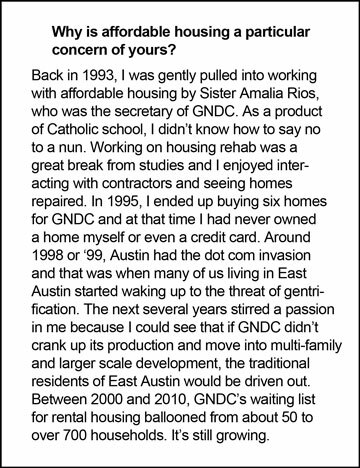 I also serve as the treasurer of the Austin Housing Coalition and the Secretary of the Guadalupe Association for an Improved Neighborhood, GAIN. Where did you grow up and attend school? I grew up in north Philadelphia and the Valley Forge area outside Philly before moving to Colorado in 1974. I received a BFA and Masters in Art History from the University of Colorado at Boulder. I came to Austin in 1986 and received a doctorate in Art History from the University of Texas at Austin. What are your major career accomplishments? Developing La Vista de Guadalupe apartments in 2008, GNDC’s first multi-family project and its first tax credit deal was a major accomplishment. We had a lot of help from Diana McIver and Associates (DMA). 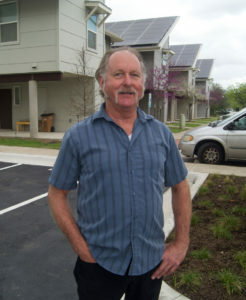 We also began work on the 11-acre Guadalupe-Saldana Net-Zero Subdivision at that time. We’ve completed four ownership units, eight duplex units and 35 multi-family apartments with supportive service, but we probably still have another five- to-10 years of work left. Developing a subdivision with multi-family, town homes, duplexes and single-family housing, with transitional housing, affordable rental units and home ownership homes is a challenge. Yet, it’s very rewarding to see a neighborhood being created. We’re also very proud to have developed the first community land trust homes in Texas and see that becoming a critical element of GNDC’s affordable housing program into the future. What are some interests of yours not related to your work or HousingWorks? I love traveling, especially related to my art history background in European art and architecture. I also enjoy all types of cooking. I think that lets me express my artistic side.